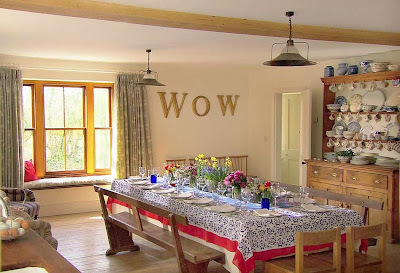 Kirstie's Homemade Christmas on Channel 4. How the other half live. What a barbaric programme for the upper middle class. Channel 4 is screening a three part mini-series featuring Kirstie Allsopp showing us how we can all supposedly enjoy an idyllic Christmas and make our own decorations to spruce up our homes. Now normally I love Kirstie, and her constant innuendoes with Phil on Location, Location, Location are the stuff of legend. But this was too much as it turned all it did was give us loads of lovely (pukeworthy) insights into how the other half live. The programme implied that posh people shouldn't buy their own tree decorations, they should in fact go to a glass blower and make them by hand, elaborately rolling them in different colours. Later, she jumped into her 4x4 (of course) and paid a visit to her 'favourite local forester'. Yes, she actually said that, as if to say we all have a forester don't we? He helped her to pick a perfect Christmas tree. It looked like an 8 footer to me, and was a lot prettier than the typical tree you get down at B&Q, as you push all the ugly bastards out of the way to find something that looks vaguely half decent. If that wasn't enough, she showed us how to screen print our Christmas cards rather than buying some in a shop or making simple ones by hand. No no, screen-printing is much more classy. Anyway, don't quibble over the cost, as once you've bought all the kit you can re-use it next year! Kirstie has a really nice home called Meadowgate in Devon, but I was disappointed by how naff this mural is. It is like a slap in the face. Why, why, why? Then she met up with two Barbour toting ladies who lunch, who have apparently been making Christmas wreaths for the last three years, mainly using foraged greenery from their land. Yes dear viewer, in all those acres you have, surely you must have some holly and moss? Anyway, the trick to start off with is to create a firm base of moss, it adds moisture to the rest of the wreath, keeping it fresh, and creates the structure of the wreath. Finally, if you're struggling for time to make all your decorations, simply visit a local primary school and employ child labour to create gaudy ornaments out of salt dough! 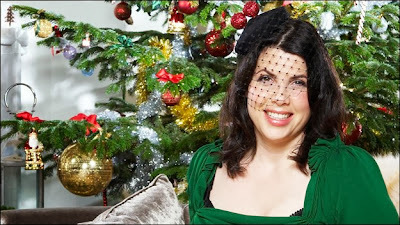 It works for Kirstie Allsopp! Don't worry as there are two more episodes to come. We will be shown how to make amazing soap and procure ourselves some 'thrifty buys' from a London street market! No doubt while scoffing canapés. I just hope we won't be expected to barter for the goods with our lovely glass blown baubles! One was rather hoping to hang them on one's crimbo tree. I don't know if you watch Gogglebox at all but this programme featured on there and the viewer reaction was very much similar to yours! I just hate the whole idea of "here's what you should be doing at Christmas". It's ridiculous! The rest of us who have to work with a budget will just move on and make the best of things. Wreaths? Glass-blown baubles? My 2-year-old wouldn't last 5 minutes with a glass decoration. How pompous. Glad I missed it!